A slideshow from Amanda & Hugh’s wedding day. Amanda got ready in her home house, just outside Donegal Town where Kerry Harvey makeup and Marie McCabe Hairdressing were on had to help with the preparations. It was then onto St Patricks Church, Donegal Town were Fr Willie Peoples celebrated the wedding ceremony. After the couple were congratulated by their friends and family it was on towards Barnesmore Gap for some photos. 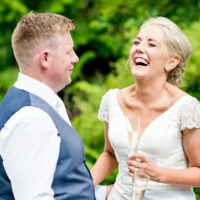 Fair play to Amanda and Hugh for getting out in the lashing rain for some photos and then we had a quick stop in Biddys O’Barnes for a few refreshments before making our way back to the Mill Park hotel for the reception. Thanks very much for having me as your photographer.